If you’ve had a website for a few years, you may find that what used to work before just isn’t getting you any real traction now. But here’s the thing. You just can’t afford to dump a bunch of time and money into something that doesn’t pull it’s weight and not bring any money in right now. I totally get where you’re coming from but let’s keep it real for a moment. If you want to attract new business in 2018, marketing is no longer a “nice to have” it is a “must have” and that means you’ve got to stay current and connected and online. Yep! I know that stings a bit but it’s time to go pro or go home. Look I’m in the same boat as you are, we’ve all got to find new ways to keep our businesses fresh and top of mind with our existing customers and prospects. If we don’t we’ll drown in a sea of noise being made by our competition and we all know there’s plenty of noise and distractions out there. But there’s hope on the horizon! One of the BEST things that ever happen to small business was the dawn of the digital age. It has lowered the barriers of entry and given small businesses a chance to expand their visibility and reach an entire new crop of potential customers with just a few clicks. This just couldn’t happen without the web – so this week I’d like to offer five ways you can attract new business with your website. 1. Host a Jam Session? This is a great way to boost sales when it’s slow in your business. Ask your customers or social media followers for their favorite playlist, song or “jam”. You could do this anytime of the year. ‘What’s your favorite slow jam? Comment below and we’ll send you a promo code to get 20% off storewide’. In the summer you could ask what’s their favorite “Summer Jam” – just like the radio stations do every year. Think about it. How many times have we heard or seen a promotion about the song of the summer? Now you’ll need to give your customers a little motivation. If you don’t want to give a discount, try giving everyone who responds a special limited-time only freebie, like a t-shirt or create a “free offer for the first 20 people to comment” to build-up interest. It doesn’t have to be too fancy and it needs to be something they can redeem online right away and for only 2 or 3 days. You can do this via a special promo code through your POS software or your shopping cart on the back-end of your site. Be sure to keep an eye on their submissions and reply to any and everyone who replies to you. You want to keep the momentum going – especially on social. Once you’ve gathered their submissions, create a “playlist” and host a 2 or 3 hour “jam session” or party featuring your customers favorite tunes. You can do this either in store or even host a live event via Facebook or YouTube online. To sweeten the deal – be sure to offer a very special promotion or giveaway that they can only get for participating in the live event. This is where you get creative and offer something really different – remember you don’t have to offer a lot. You can invest in 2 or 3 really nice prizes or offers and raffle them off during the event. This is super important for storefronts and anyone relying on foot traffic. 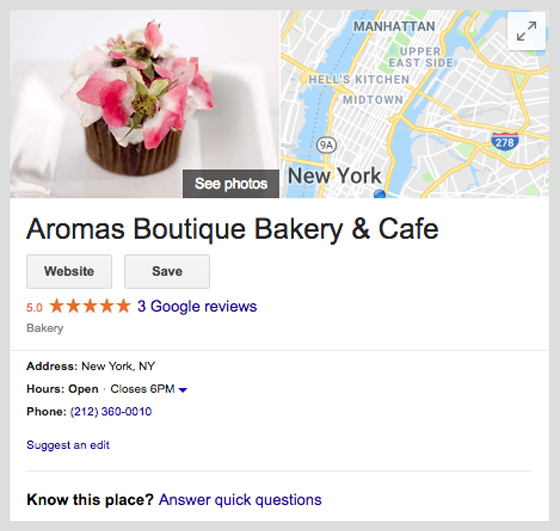 Google Places gives you a chance to add photos in your business listing. Make sure you add them, it can truly impact whether or not a potential customer will take the time to visit you. This feature is so important that Google even offers a photography service with Google-approved photographers called Google Street View. You don’t have to use Google Street View, but these photos are used in Google Places, which means they will show-up in Google’s search results. Just check out Aromas Boutique Bakery & Cafe below. They happen to be one of my clients and these two sisters really take advantage of all the technology out there. 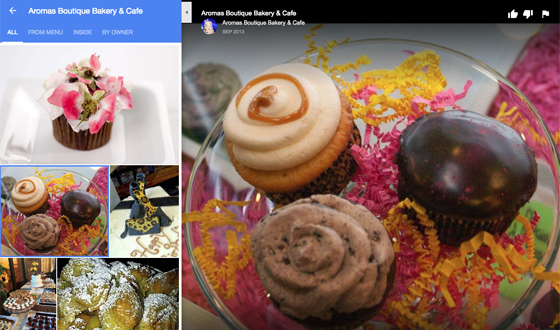 They use their photos to entice customers to stop by their bakery and made sure to include their website as well – so you have the option to learn even more about them via their website. Super-easy and it’s all done with just a few clicks on your phone. I can’t tell you how many times I’ve used this in the city and when I’m traveling. When your short on time seeing photos of a place you “might” go to can really motivate you to make the effort to check it out. It’s not that different from when you’re searching for a place to rent on Air BnB or even when you’re looking to rent or buy a new home. It’s like the old saying goes a picture’s worth a thousand words. 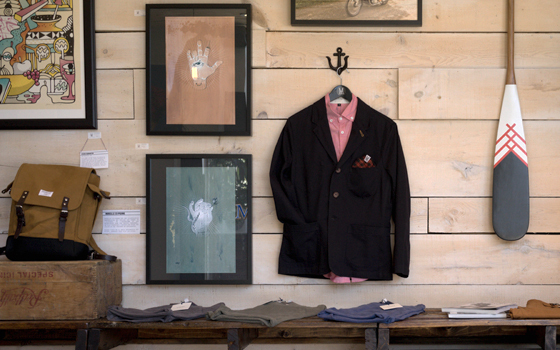 Have a new product or service you’d like to show your customers? This is a perfect way to do that. You can use Facebook Live or Google Hangouts via YouTube or even Instagram stories, to host your event. These videos have all but taken over the food and beauty industries, but they can work in other industries too. You can even turn your Powerpoint or Keynote presentation into a seminar or workshop online and reach a whole new audience and new business. Set up a reward program that allows customers to collect points either via an app like Fivestars or Square Loyalty. Loyalty programs are a great opportunity to drum-up repeat business from your existing customer base and it helps keep your bottom line profitable and healthy. You can offer different ways for customers to earn points without making a purchase. For example, you can offer points for attending a live event, giving feedback on a survey or leaving comments to your questions via social media. You can even offer points for just signing up for the loyalty program itself or your email list. This is almost a no-brainer but it’s a great way to give back to your community. All you have to do is create a promo code or offer a certain percentage of the proceeds for a particular product or service, to a charity that you hold near and dear to your heart or is a good match for your business. Now the trick to all of these promotions is to be sure to integrate your website with them. You see, you want the majority of the work to be automated and happen online and ideally on your site. This will boost engagement and give you a few more “brownie points” on Google. If you’re using a CMS for your website it makes the whole process much easier. 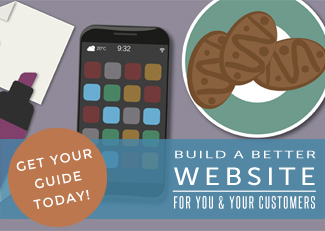 You can learn more about them here: “Why Your Website Needs a Content Management System”. So now I want you to take out a sheet of paper (or open your favorite app) and jot down how you can offer any of these ideas throughout the year in your business. Then go back a take a look at what’s in your wallet, look at the credit and loyalty programs your favorite stores offer for even more ideas. Once you’ve got at least a dozen or so ideas written down, pull out a calendar and figure out which week or month you’re going to run that promotion. Be sure to give yourself at least two months to prepare and spread the word about in advance so you can get the most bang for your buck. 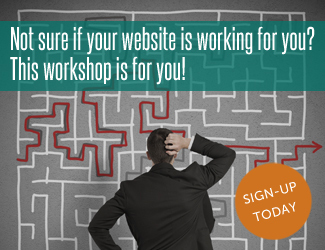 Question: How do you currently use your website to attract new customers or new business? Share your comments and questions below.